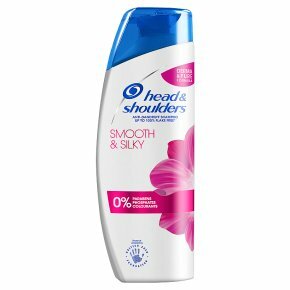 Head&shoulders smooth & silky limited edition, richly indulgent anti-dandruff shampoo is expertly formulated to moisturise your scalp with regular use and add silky smooth shine to dry, damaged or frizzy hair, while giving you up to 100% flake free* hair with a fresh scent that lasts (*visible flakes from 2 feet with regular use). Smooth&Silky Anti Dandruff Shampoo controls your frizz to give you beautiful smooth and shiny hair. Derma&Pure formula effectively fights Itchy Oily and Dry scalp to Stop dandruff before it even shows. Dermatologically tested, colour safe formula with antioxidants for gentle care of hair and scalp. Keeps hair beautiful and up to 100% flake-free (with regular use). Worlds Number 1 Shampoo Brand. Formulated with no unwanted ingredients: 0% Parabens, 0% Phosphates, 0% Paraffins. Smooth & Silky Anti Dandruff Shampoo controls your frizz to give you beautiful smooth and shiny hair. The advanced Derma&Pure formula, which is safe for coloured hair, effectively fights Itchy Oily and Dry scalp to Stop dandruff before it even shows. Smooth & Silky Shampoo is designed to give you beautifully moisturised hair and scalp that is up to 100% flake free (visible flakes, with regular use).